South Indian cuisine includes the recipes of the five southern states of India: Andhra Pradesh, Karnataka, Kerala, Tamil Nadu and Telangana. 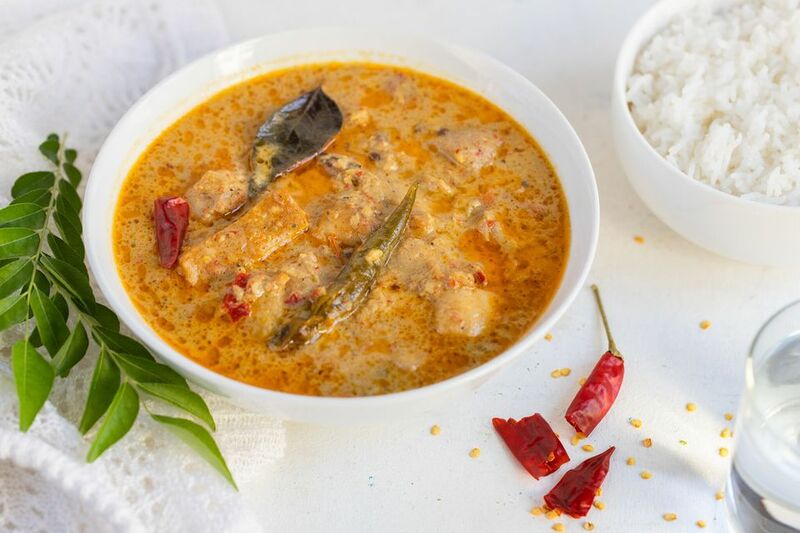 This South Indian fish curry recipe, also called meen kulambu, is a delicately-flavored dish that can be served with idli (a savory cake) or dosa (a type of fermented batter pancake). This dish is traditionally served with plain boiled rice and the tamarind in the gravy gives the rice a lovely tangy flavor. Use a mortar and pestle to pound the dry red chilies into a coarse paste using a teaspoon of water. Squeeze the soaked tamarind well to release all the pulp from it. Strain the thick tamarind juice and discard the pith and seeds. Mix the red chili paste and tamarind juice with the coriander and turmeric powders and salt to taste. Then add the grated coconut and half the coconut milk. Mix well. Put the pieces of fish in a large, flat dish and pour the above mixture over it to cover. Make sure all the pieces are coated. Marinate for 3 hours. Heat the cooking oil in a deep pan, on a medium flame till hot. Add the curry leaves, fenugreek seeds, green chilies. Fry for roughly 2 minutes, or until the oil stops splattering. Now add half the onion paste. Fry until the onion begins to brown very slightly. Fry till the spices start to release their oil and tomato turns darker. Stir frequently while frying. Now add the fish marinade and stir. Bring to a boil over medium heat. Add the garlic paste, pepper, cumin, remaining onion paste, and remaining coconut milk. Simmer and cook until oil begins to appear on top of the gravy. Add the pieces of fish and cook till done. If stirring, do so very gently to avoid breaking the pieces of fish. Serve South Indian fish curry on top of plain boiled rice and enjoy! The availability of different varieties of fish makes this dish very flexible. Feel free to use rainbow trout, tilapia, or even pollock if you don't have the threadfin bream that is commonly used in this dish.